Home is a combination of many things: structure, people, time and most of all, love. It’s the whole of these parts that makes up one of the most consistent aspects of our lives. Only through the accumulation of care, experience and time does the house you are living in become your home. Many of the older Cape Cod cottages we see along the Northeast’s shores were built by the seafaring men of New England: the carpenters, shipwrights and fisherman. Their homes were constructed like their ships and boats, sturdy practical and set low to withstand the winds borne by the sea. Paul Landry likes to paint them so they do not dominate the land around them, like a mansion. Rather, they are part of their space, nestled snugly in their surrounding of trees and gardens. A favorite element is a white picket fence, centered with a trellis to invite visitors in. Humble, simple and beautiful, these cottages are uniquely our own. Pining for the joys of warm summer breezes? Beside the bay is a little cottage, nestled in by a picket fence adjacent to an arbor. The flowers burst with color and beauty all summer long, while the water reflects the multi-blue shades of the sky. 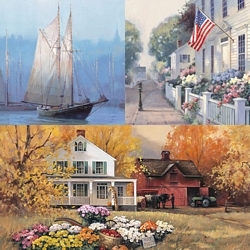 Enjoy the fresh breath of balmy salt air year-round with Paul Landry’s "Cottage by the Sea."